TASKS : 1 = Disoriented at home or public place >> Center >> Redirect >> “Find” husband; 2 = Disoriented during daily walk >> “Find” home; 3? = Balance-Assist; 4? = reminder to stop before crossing road while on daily walks; 5? = cardiac-alert for stroke; 6? = prevent convulsions from blood-sugar crash by meal reminder; 7? = smoke-sensor when away from home (vs smell-hallucination). BREED: Prefer Poodle or Retriever mix. Tru here. What are my qualifications for this subject? I owned dogs all my life, then trained & was handler for two wheelchair assistance-service dogs over span of 15 years. I gave public presentations on Service Dog issues during those years, and for two years I represented service dog handlers at the County level. When considering “Service” (or “Assistance”) Dog issues, usually the first topic that needs discussed is tasks. If I truly NEED a service-assistance dog, then what other tasks can/should be done by my dog? By definition, a “Service Dog” must be executing trained tasks that will mitigate my own identified dis-abilities. Places of business do not have the right to ask what my dis-abilities are, but they DO have the right to ask what tasks the dog is trained for that will mitigate those dis-abilities. So what should those tasks be? (What exactly does the dog DO that increases my independence?) My primary task has already been pre-determined, as that was the need which led me to seek another Service Dog. 3? = IF I decide to go for a larger dog, then third priority would be balance-assist (“mobility” task); including “brace” to assist standing from sitting position, and probably walking harness while walking (instead of current canes or walker). Note that I do not believe in depending on a dog to prevent me “wandering” (when I get to that stage) — altho the dog’s behavior might be helpful. See Link #4 below by Joan Froling. TRAINING: Service dogs for dementia tasks are available to be trained by several organizations, but none are local, and I would prefer to go with my own standards and procedures anyway. I self-trained two wheelchair service dogs in past, and with my dementia symptoms, I cannot afford to wait long for beginning the process, so I will be finding dog (probably as a “rescue” … but possibly as young pup from breeder) and self-training this dog also. My primary training techniques are from the “Top Dog” series called “Teamwork” (for dis-abled persons to train their own Service Dog tasks). Link #5 below. Advantage of breeder would be more knowledge of medical and temperament backgrounds for parents and grandparents. AGE: Needs to be either a puppy or a young dog (prefer under 2yrs old, but up to 3yrs if ideal candidate in other aspects). With my dementia symptoms house-training will be much more difficult, so prefer past that stage of puppyhood if possible. Trade-off: young puppy easier to train tasks and stronger bond, but if young adult, then trainer is better able to ascertain joint integrity and better able to guess whether their personality will enjoy life as a Service Dog. 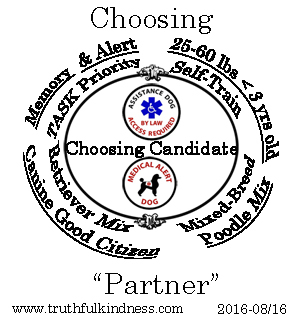 Hero was rescue at 2.5yrs with ideal temperament for Service Dog, in contrast Blessing was young puppy from reputable breeder … she was extremely smart, but her temperament would have been more suited to an athlete than having a heart for service or partnership. SIZE: For balance-assist task, I prefer a dog that has half the weight of handler, or more. So IF I go for larger dog, 60-80lbs would be target weight, with height approximately 26″ at shoulder. If I do not request mobility assistance from the dog partner, this allows me to search for a smaller dog, who will easily fit in front of my airplane seat and under the restaurant table. However, walking 10 miles a week in this pet-heavy community, I need a dog who will avoid triggering prey drive in larger dogs. I also need dog who is heavy enough to give momentum when leading me on “Find” command. I think anything larger than 25 lbs and less than 60 lbs would be ideal for “smaller” dog. Dog needs to be light enough weight that husband and I can handle their care during later years of dog’s life, so cannot have another Newfoundland. PERSONALITY: Looking for a dog who will fit the description of “Partner”. One who is not timid, but more motivated to please human partner than motivated by food or other canine peers. One who will be (of course) interested in canine peers, but MORE interested in what his human partner is doing — unless the human is not doing or saying anything. One who is active and would enjoy walks of 10 miles per week, but by adulthood will be satisfied to sit quietly during my meetings several times a day. We live in semi-rural area where walks will include many different ages and types of animals and people. Like me, many will have mobility issues. Dogs, cats, squirrels, ravens, turkeys, horses and deer are not uncommon, along with possible issues such as skateboards. Deer often bed down in side yard of our house, and I have pet chickens (who will be on other side of fence until or unless dog shows that it will not be a problem). Personally, I need to avoid strong prey drive in my own Service Dog candidate, and would also like to avoid strong food-drive because I want it to be mostly driven by desire to please or (like Hero was) desire to meet a need in the humans around him. Hero was known for discovering the needs in multiple humans around him, and arranging it where he could meet those needs (check out his story at link bottom of page). Generally, for Service Dog candidate selection you want to avoid any “shy-sharp” tendencies, snappiness, anxiety, or over-protective bent. Good question for part of that aspect would be, “How hard do you think it would be to train this dog for “Canine Good Citizen” certificate? Ideally, the dog will ENJOY the gift of giving service, just as some humans enjoy giving service. Some dogs have ability to train as Service-Assistance dog, but do not enjoy the role. Those animals need to be pets instead of put in situation as Service-Assistance dog. BREED: Poodle was the first breed known to be used as service dog (guide dog for blind in 1600s — see Link #6 below), and Retriever mixes are currently best known for Service-Assistance Dog characteristics, but many breeds can be successful with the right circumstances. Many breeds have been so thoughtlessly poorly-bred, that it can be difficult to find promising Service-Dog candidate. Since I am currently looking at dog from a “Rescue” organization, must keep in mind that the dog’s history is always a possible issue with any rescue dog. Because of that, I do not want a mix with breeds that are known for possible aggression, over-protection, anxiety or dominance issues. Joan Froling has written an article on breed selection for SrvDog, found at Link #7 below. My first copy of the 1980’s book, “The Right Dog for You” by Daniel F. Tortora PhD was used so much that it completely fell apart and is held together with large clamps, so we now have a second copy for loaning to others. Link #8. My Newf Hero was the ideal Service Dog, but I now need a lighter-weight breed, so prefer a larger poodle or somewhat-smaller retriever mix when getting a dog from rescue organization. Link #9. For many folks, length of coat would not be an issue (except for care-maintenance) but for me it is. Since I no longer NEED a large dog, a smaller dog can be groomed locally, and with my personality, it will be much easier for a dog with a “fluffy” coat to get my attention when I am disoriented and confused. In fact, even as a toddler I have been very drawn to poodle breed, so that is probably the breed mix which will be most successful at getting my attention for tasks of “Center” and “Redirect”. PROVISIONS for dog safety and care: husband is back-up for feeding and all needed care for my dog; Despite 15yrs with cognitive impairment, my dementia symptoms are definitely progressing, but still progressing very slowly with my IQ still “above normal”, so expect another 10yrs productivity before I hit severe symptoms when my dog will be solely under care of my husband. Currently most of the training and care will be by me. I trained two newfoundland service dogs for wheelchair assistance, and represented service dog handlers at County level for two years, so this is not an insurmountable obstacle. The problem is that, just like my hunger impulse no longer works properly, back-ups need to be in place for feeding and other aspects of care. Since I do not remember whether animals have been fed, watered, and where they are (unless I can see them) back-up for their care is crucially important !! 9. Memorial for Hero the Service Dog at http://tribute.perfectmemorials.com/hero-service-dog ; 10. * Admin issues: SHARE dementia awareness thru buttons below. Feel free to leave your thoughts in the form of comments, but please filter your comments with truthful loving kindness to all concerned. If interested in receiving notice of future blog postings, subscriptions are available through a “follow” button in the upper left corner (MS Explorer) or lower right (Safari, Mozilla Firefox and Chrome). If there is an advertisement below, I have no control over what is shown. My own full legal name is Truthful Loving Kindness. My current diagnosis is Mild Cognitive Impairment, but my neurologist said I am in a unique position for helping because I have “one foot in each door”. Copyright 2016-08/16. Search terms: dementia, disorientation, memory, assistance dog, service dog. 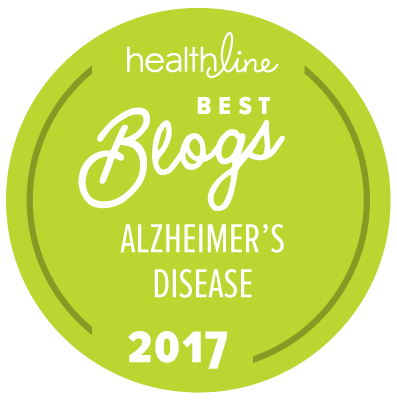 This entry was posted in Important, Journal, Service Dog and tagged assistance dog, dementia, disorientation, memory, service dog. Bookmark the permalink. ← ?Are YOU My Husband? Paulan Gordon: Best wishes on finding the best service able dog whom you will love and depend upon.